When you rent iDisk space from Apple, on the other hand, it immediately appears like any other disk on your system, and you just copy files to and from it transparently. Unfortunately, as well as being more expensive, this process seems to be a bit more error-prone. Sometimes iDisks freeze, and you can’t Force-Quit them like you can an ordinary program. Step 1. First, go to your Applications folder, find the Utilities folder, and open up your Activity Monitor. 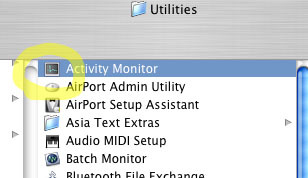 Unlike the window that appears when you give the Force Quit command, the Activity Monitor will show any hidden programs you have running in the background. Step 2. Find the program, or “process,” called mount_webdav. Click on the “stop” button. Step 3. Confirm that you want to close your crashed iDisk. You can now reconnect and resume what you were doing, without rebooting your whole machine. Any files you were in the process of copying are probably incomplete, and need to be copied over again. Nice. I googled “Force quit idisk” and ended up here. I followed your directions and now am on my way. Most of time freezing and erroring. Worked perfectly and immediately! 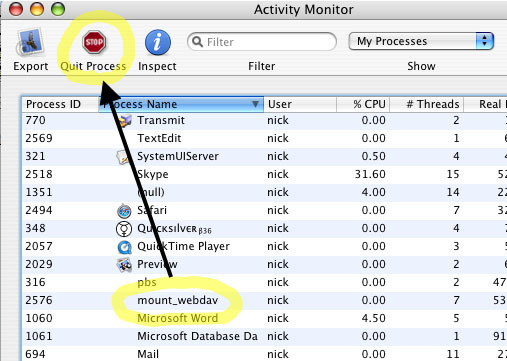 I’m in Leopard OSX 10.5.6, and the process I stopped in the Activity Monitor was called webdavfs_agent. Thank you so much, my iDisk was totally a spinning beachball for days. Thanks Everyone- Online forums are the best for troubleshooting. Thanks to everyone who post solutions! wise. I can not wait to learn much more from you. That is actually a terrific website. post is in fact fastidious, all can effortlessly understand it, Thanks a lot.